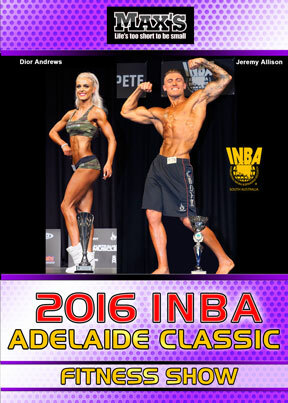 The 2016 MAX’s INBA Adelaide Classic Bikini & Fitness Show was the second of 2 events held at the Norwood Concert Hall – on Sunday, May 1st. The Overall Champions were JODIE DOWLING in the Bikini Class and DIOR ANDREWS in the Fitness Models Class. MEI CAI won the Men’s Fitness Model Open Class. The 2016 MAX’s INBA Adelaide Classic Bikini & Fitness Show was the second of 2 events held at the Norwood Concert Hall on Sunday, May 1st, 2016. There were many incredible competitors, and once again the depth and standard of competition were outstanding. The Overall Champions were JODIE DOWLING in the Bikini Class and DIOR ANDREWS in the Fitness Models Class. MEI CAI won the Men’s Fitness Model Open Class, and JEREMY ALLISON won the Mr Physique Open Class.